There, I said it. And it feels really, really good to say it. I know it's only been two weeks and a handful of runs/bike rides. But I hate it. And I need suggestions on an attitude adjustment. My old running route along the West Side Highway in upper Manhattan was idyllic. It was quiet, serene, peaceful, and beautiful. It was possible to have a bad run along there, yes, but it wasn't possible to be in a bad mood while there. (I know; I tried it. Without fail, I felt calm when I was there.) The river, immediately adjacent to the path, was picturesque. You were in the city and yet you weren't, all at once. I loved it. But now my old route is an impossible hour away by subway and I'm stuck running in Prospect Park. And I hate it. I realized why when I was running this morning: it's the outdoor equivalent of treadmill running. The perfectly paved path, the carefully manicured greenery, the loop that twists and turns at just the right casual-yet-completely-planned trajectory... It's manufactured outdoors. Outdoors lite. Combine that with its popularity. Moms walking four abreast pushing strollers. Parents teaching their kids how to rollerblade or bike. Runners, walkers, fast and slow, taking up my path. Plus, like its Manhattan neighbor (Central Park), it's a fashion show. I know I should feel grateful that I live less than half a mile from a scenic, paved running trail. I have an uninterrupted 3.36m loop, and I don't have to run through the streets, stopping at lights and for cars. But instead I feel like a petulant, pouty brat who wants to stomp her feet and shake her fists at the thought of doing another loop of that damned park. I can listen to music to drown out my own boredom, but I don't like to rely on my headphones. I agree, I'm no lover of Prospect Park. My advice is to get up super early (before all the traffic and crazies on the sidewalk) and take it to the streets. Could you run the perimeter of the cemetery for a change? I have to try that - I'm not exactly sure how far it is from my apartment, but it's worth checking out! The perimeter of the cemetery is not great - at least not all around. There are good chunks of it that are unkempt particularly on the Sunset Park side and then there's an area where day laborers congregate hoping to be picked up for work. I'd be happy to share routes with you. Do you use mapmyrun? I don't, but I'd be happy to sign up for it if it means new running routes. Please, please! 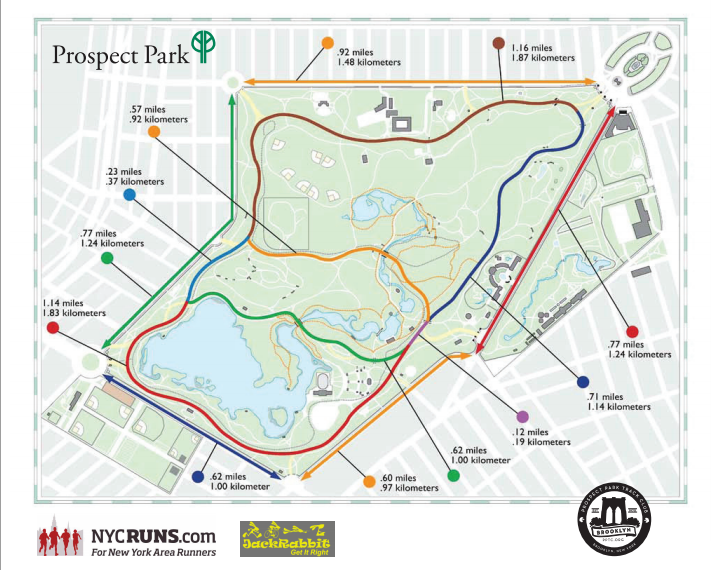 There are a few non-Prospect Park routes on that page. I was also thinking that you're now in much closer proximity to a ton of clubs, right? Maybe join them or North Brooklyn Runners or somebody else? I feel like it would be easy to ignore park boredom if you had a lot of people to talk to. Finally, are there any greenways / bike paths around there? When I'm there, I see those paths that run along the ocean (granted, near Coney Island or as far out as Rockaway, which is nowhere near you) but they must lead somewhere - maybe to you??? I don't know. Good luck! True confession: I joined PPTC yesterday. (NBR would be WAY too far from me.) I need to figure out the non-Park routes, for sure, esp. bike paths, etc. I've heard tell of these trails. I will try that - anything to avoid the strollers, ugh. PS - You could always turn Prospect Park running into a game in your head... "Pick off the preppies." Find a smug-looking person up ahead, run as hard as you can to pass the person, then feel superior because you passed the person. Slow down around the next bend once they can't see you. Call this "fartlek training." I like your ideas. Running on the streets is okay, but the stop-and-go of the street lights wears me down (although I like the idea of running the perimeter of the park, because the pedestrians don't bother me. I like the running game, but I lack any and all competitive drive - and people in that park can be really freaking good. My (limited experience) city running strategy has always been to go at ~5am when there are fewer asshats around. Of course, that doesn't always work out for safety & comfort now that we're on the dark side of the solstice. The Google images of Prospect Park make it look pretty darn nice, but the strollers would make me want to harm something. I bet you'll get in a rhythm with the Brooklyn running... right now is just that uncomfortable transition where you're still gutting through the process of figuring out how to make it work... I'm gonna be dealing with the same thing in a few weeks. May need to pick your brain for Philadelphia running insight at some point. Is hip-checking the particularly irritating stroller moms a no? You are going to LOVE running in Philly. I personally found the 8.5m art museum loop awesome, and I suspect if you start running in the early morning, you'll see a lot of rowers along Boathouse Row. Oh! I miss it so much. The only problem is getting there, which is a little bit of an obstacle course. I used to keep track of every intersection where I'd nearly gotten hit by a car, which was pretty much every intersection en route to the art museum loop. Sweet. I love Forbidden Drive/Wissahickon park area, but going there on a daily basis isn't really going to work timing/transportation-wise... so figuring out the best way to the Art Museum loop from my apt is on my immediate to-do list. I can't even tell you how hard I try not to hate it. And in this particular case, 'it' could be expanded to encompass Brooklyn in general. The fact that my marathon training has been horrendous so far doesn't help. But sometimes when I think about doing more than one loop of PP, I just want to sit down and cry. I've been thinking about joining PPTC. Also, I feel really bad that we haven't seen each other since you moved here. I blame myself entirely. I hate the loop, but I don't hate Prospect Park. It's the main loop that's annoying everything else is blissfully empty and if you dare to go off-road and hit the trails you'll find the park can get very quirky with the time-space continuum. I almost never run the loop.